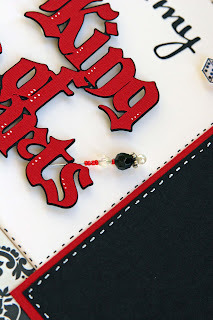 Liz's Paper Loft: My Creative Time's September Release ~ Sneak Peek Day #1! My Creative Time's September Release ~ Sneak Peek Day #1! Hello! I'm so excited to share with you, Emma's newest release! Emma has outdone herself with these new stamps and dies...you probably think that every month! lol! Today all of us on the Design Team will be showcasing the same set, Game Night! This set is just adorable, you can use it for cards, layouts, invitations and so much more! I decided to make a layout with it. Lovin' this LO! It would be perfect for my hubby. 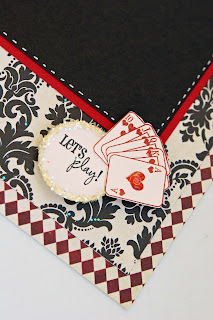 That little deck of cards stamp is soooo cute =) Thanks for the inspiration. Cute LO Liz. Love the DP that you used. Love this LO!!! Loving the dice!!! TFS! Very cute LO! I love the colors! This looks gorgeous! Can't wait for the big reveal on Friday! This is so cute, thanks for sharing a layout!! Can't wait for tomorrow's sneak peek!! What a fantastic layout! I love it! Liz, your layout looks awesome! Love it! This release looks really fun! WOW - this is an INCREDIBLE layout!!! Love the color combo and the papers you used!!! What a perfect layout I love it. Awesome layout, Liz! What a perfect way to use these stamps! Very very cute. I love the layout. Great job and love the little cards and stick pin. Thanks for sharing. cute Cute CuTe LO!! I'm lovin' the paper combo!! Gotta have these stamps/die. Super cute layout! Love the paper you used! Awesome Layout!!! I love the sentiments and that cute stick pin embellishment!! Great Job! Love the layout and the paper choices you have used for it. The little dice are adorable!!! Great LO! That font is perfect!! OOOOOO this is so pretty / gorgeous / classy and FUN! I love it. I can't wait to see the new releases - whoo hoo! Fabulous job my dear. OMG Liz this is one awesome layout ! I love love this ! I am wanting this set more and more with every blog I go to ! You ladies ROCK ! TFS ! Loving the color combo and layout, very nicely done. Gorgeous layout!!! Your little accents are perfect. Great job Liz!!!! This LO is awesome and the pin is a nice addition to it! TFS. Have a lovely day! Love the layout! Lover it! Beautiful! This new set looks adorable! I love the little group of cards at the bottom - cute! Fabulous LO! Loving the new stamps. What a super cute layout! It looks perfect!! looks like it is gonna be another sell out!! can't wait until Friday! great layout!! looks like it will be another sell out! love the projects! can't wait until Friday! This is one awesome Layout,Liz!! I love the papers you have used,the title and how you've used the stamps! Just perfect!!! Very cute LO. These are my favorite colors! TFS. Great idea for a layout! I love your projects. The colors are perfect and you are VERY creative. Your colors are perfect on your layout. 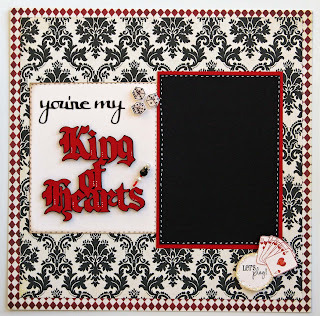 This would be perfect for a more masculine look "King of Hearts". This stamps set was just perfect for your layout. My gosh. I have that paper! And those carts. I'm going to make. What a beautiful layout!! What size is it overall? What size photo will you put on it? This is the perfect card for hubbies! I love it! The is beautiful!! Love the layout and that paper is gorgeous!! Such a FABULOUS L.O., LOVE IT!!! Oh I love this! Very sweet! I love this layout. It's awesome and what a great way to showcase the new release! very creative card. like how you placed the cards and with the pretty stick pin. Just love your King of Hearts layout it is such great idea ! Thanks for sharing! This is a great card & release. Like to see the stamps on a scrapbook page- nice work. Very simple yet cute card. Love the layout. What an awesome LO!! Love how you used Emma's stamps! Awesome layout.... I love everything about it!! Nice fun yet very elegant layout! Thanks for sharing. Wow I love this card good job on it girl. Very nice! I love the elegant background! Love the black and white with a touch of red. What a great layout. I love everything about this! The paper is awesome. I am in LOVE with the Blackletter font. And I love the colors. Awesome job!!! Great layout, can't wait to see the new release. Great job on the layout...love all the little details...your pin is beautiful too. beautiful layout looks great, the red really pops. Very, very creative! I love that idea! Oh oh oh love this layout, those little dice and cards are so cute! 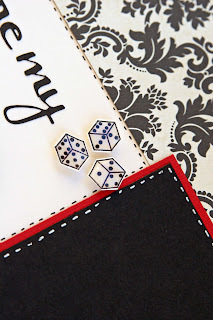 What a great layout, love the Cricut cut with the game piece stamp's. It is adorable. love the stick pin! good lookin' project!! Love this layout! The colours look fabulous together! Very cute Layout! Great Job!